Welcome to another Feminist Friday, that time of the week where we depart from our regular programming schedule and feature 3 of our fave videos that we can’t get enough of right now. Centered around intersectional feminism, this week our videos are focused on the theme of breaking stereotypes and making justice happen. 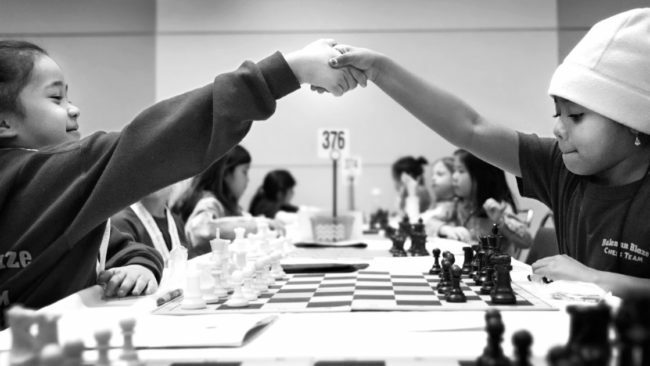 Our first feature is a short film from director/producer Jenny Schweitzer called ‘Girls in Chess’, which spotlights the gender gap in the world of competitive scholastic chess. Filmed at the 2018 KCF All Girls Nationals in Chicago, the girls featured in the video are very aware of the gender stereotypes they are up against, but their skill and determination are inspiring and make you realize why it is important to address issues of inequality. In an article for The New Yorker where the film first premiered, dir./prod. Jenny writes how her youngest daughter showed an interest in chess but has been reduced to tears by some tournaments due to the bullying and taunts from her male competitors and their parents who discount her ability because she is a girl. It was one of the reasons she was prompted to delve into this world to make people aware of just how pervasive sexist attitudes can be, and why organizations need to do their part to address it. Thankfully, the girls she featured aren’t going anywhere, and they are undoubtedly going to empower other young girls to join them in the competition. The second video this week comes all the way from Iceland, and it is a promo video for the awesome Iceland Airwaves music festival. The reason we are so pumped on discovering this event is their commitment to gender equality both on stage and behind the scenes, something that is sorely lacking in the world of global music festivals. Anna Ásthildur Þórsteinnsson, the festival’s online manager, says the key is intersectionality and supporting emerging talent across genres. “The goal is really to create a network of people and strengthen the ties of the movement. Airwaves is, of course, lucky because there is a seemingly endless supply of amazingly talented women in the indie and pop genre,” she said. She also addressed the potential backlash as well as naysayers that point to more male-dominated genres that could make it difficult to find complete gender equality. “Starting a conversation on this topic is just really important. If festivals say that they don’t want to engage in the equality pledge conversation, it’s kinda revealing. Not all festivals are the same; a multi-genre showcase festival is very different from, say, a hard rock festival. But it’s great that everyone has an opinion on this, and if they’re not ready to pledge, they’re at least alerted to the change going on around them,” she said. It’s not just on stage where Airwaves has made waves, but also behind the scenes where 50% of the staff are women. Iceland Airwaves is part of a larger grassroots movement happening in the country within the music industry which is definitely contributing to the progress they are seeing. Our final video this week comes from our new fave beauty brand, The Lipstick Lobby. They are not just any ordinary makeup brand, they are a social justice brand presenting the world with a simple way to protest: a bold statement lipstick. “Born from the devastating impacts of the Trump administration, we want to offer an immediate and simple way to speak up and speak out: a bold statement lipstick!” says a description under one of their videos. Gaining prominence at a time when women are rising up in numbers running for office, advocating for social justice, and starting some of the most important social justice movements in modern American history, the Lipstick Lobby is centering their products around issues they care about. Recently, they have partnered with activist and author Gloria Steinem and actress Selenis Leyva of ‘Orange Is The New Black’ for an important collaboration with the unPrison Project, a female-led nonprofit that teaches marketable skills to women in prison and helps them stay in touch with their children while incarcerated. With the data showing that women are the fastest growing prison demographic in the United States, initiatives like this are important and show how every brand can make an impact. Sales from their $19 ‘In The Clear’ lip balm will go to UnPrison, and they are available for purchase at Opening Ceremony stores in Los Angeles and New York. The video below was made to promote their FIRED UP! shade of orange that raises awareness about the effects of gun violence. “In this behind the scenes video, just a few of the many inspirational women from our The Lipstick Lobby campaign tell us why they are #FIREDUP for our new fiery orange shade supporting gun violence prevention. Our campaign brings together women of all ages, backgrounds, cities and stories that each have a personal relationship to gun violence and are activists for the cause. From Sandy Hook to Parkland to Columbine, we spotlight the decades of gun violence in this country and ask you to join us in purchasing a lipstick,” they state in the description. 100% of the profits from this lipstick shade go toward The Brady Center to Prevent Gun Violence.